The Center of Gravity (COG) is calculated from the sum of prices over a user defined period. A signal line which is a moving average of the COG is also plotted. Adjustable guides are shown to fine tune the signals. The user may change the input (close), method (EMA), period lengths and guide values. Above is a 4-hour candlestick chart of the S&P with the Center of Gravity plotted as an oscillator below the price chart. The COG is plotted as a histogram with a 5-period signal line drawn in red. The histogram is overlaid with buy and sell markers showing the turning points of the Center of Gravity confirmed by the signal line. Oscillators work well with sideways markets, finding turning points at market tops and bottoms. The COG provides an accurate reversal signal at market turning points during sideways markets. I like to visually see a sideways market before taking oscillator buys and sells at overbought and oversold levels. During a trend move, its best to determine the trend and trade in the direction of the trend, using the COG to buy in an uptrend and sell in a downtrend. The danger is to use the COG as an overbought and oversold indicator in a trending market. 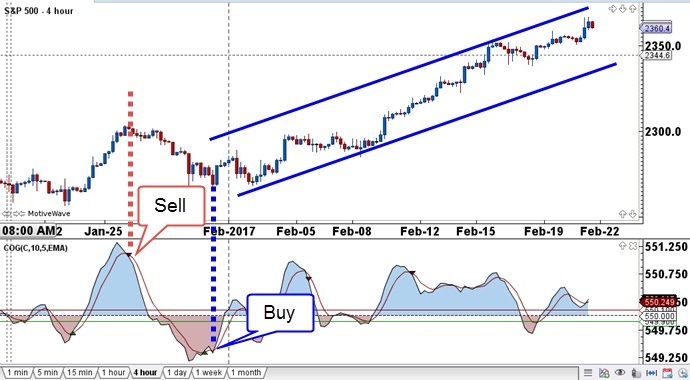 The COG can be used to find the end of the trend only when it shows divergence; otherwise, the trader will be picking tops and bottoms before the end of the trend is confirmed. In the 4-hour S&P chart below, the price action on the left is sideways, so the first two major sell and buy signals are clean and profitable. When the uptrend begins as evidenced within the blue channel lines, its best to use the COG to buy within the uptrend. Adjust the top and bottom guides to control the quantity and quality of the trading signals. If the COG is above the top guide and crosses below the signal line a sell signal is generated. Conversely, if the COG is below the bottom guide and crosses above the signal line a buy signal will be given. In example below, the 4-hour USD/JPY is trading sideways and the COG provides good turning points which are confirmed with divergence. The first signal shows bullish divergence, where price makes a lower low and the oscillator makes a higher low. 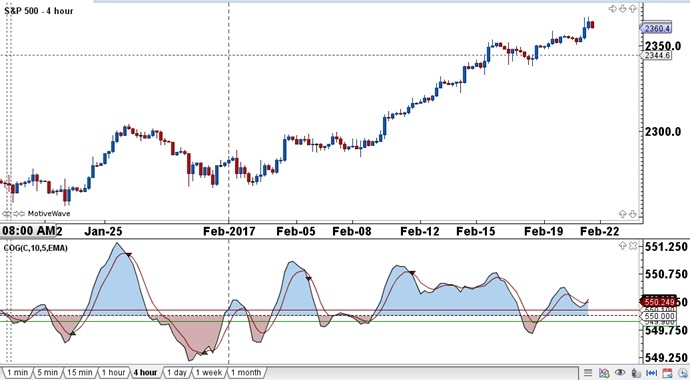 Bearish divergence appears next in red, with price making a higher high with the oscillator making a lower high. In a sideways market, the end of trend confirmation with COG divergence works well in providing reversal signals. 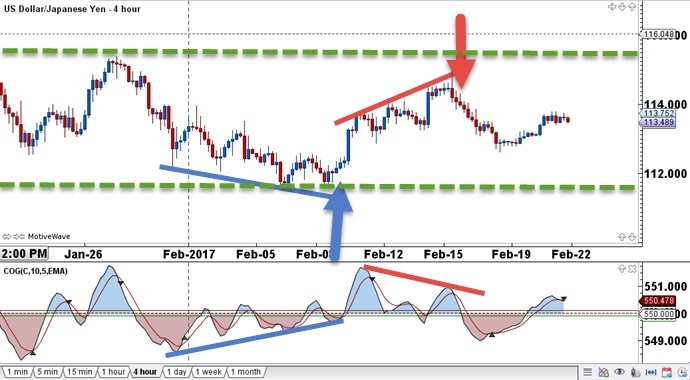 Learn how the COG oscillator helps define the trading range in sideways markets and confirms when the trend is running out of steam. Start incorporating the Cost of Gravity into your chart set-up. Finally, use the COG in developing trading strategies. This entry was posted in Trading Tips and tagged Center of Gravity, forex. day trading, trading strategy, trading system.